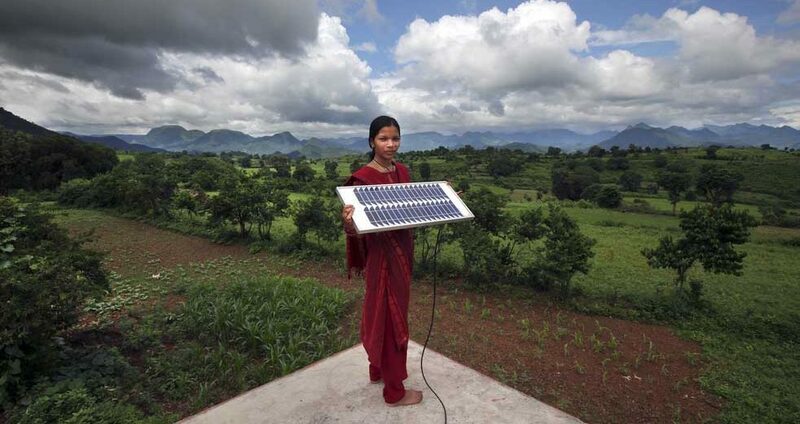 Will Solar Help Alleviate Poverty in India? In India where 300 million are living without electricity, solar power could make a big difference. As European countries are looking towards naturally replenishing resources to combat pollution, modern technology might be just as efficient in alleviating poverty in less developed parts of the world. Can solar power swoop in and save the day? Many would be tempted to say “yes” right away, but the answer is just not that simple. Pressed by poverty and overpopulation, India’s problems go beyond a simple need to keep up with the times. About 300 million citizens – representing a quarter of the country’s total population – still don’t have access to electricity. But for those who do, India’s increased usage of solar power could at least help cut their monthly expenses. For this reason, as well as to reduce the country’s massive usage of coal consumption, authorities have developed a plan to gradually switch to renewable energy. And here’s how. India has everything it takes to become a leading solar energy harvester: a favorable tropical location, about ten months of sunny days in a year and enough land to host vast solar panel plants. More energy can be generated from solar power than the possible output of fossil fuel reserves in the country. And of course it would all be clean, renewable energy, as opposed to the highly polluting coal reserves it has been using, as the world’s third largest coal consumer. A recent study by Deloitte and the Confederation of Indian Industry says the country’s solar power could reach as much as 749 gigawatts. Unfortunately, the same study points out that, presently, less than 1% of this capacity is being used. This is what the Government is looking to improve on right now, and as of August 2015 the installed solar power capacity has reached 4,229.36 MW. An additional 10,000 MW should be installed by 2017, and by 2022 the total capacity is expected to reach 100,000 MW. This year, Prime Minister Narendra Modi has approved a complex plan to develop 50 solar cities across the country. The Southern state of Kerala has built the world’s first solar-powered airport in Kochi, while up North, in Rajahstan, Jaipur airport has also announced its intentions to go green, along with Jodhpur, Jaisalmer, Bikaner and Kishangarh airports. Meanwhile, the central Indian state of Madhya Pradesh will host the world’s largest solar power station, which is expected to be set up by March 2017. With a total capacity of 750 megawatts, the facility will be built on a piece of barren land owned by the government. There are still millions of households that don’t have electricity and India is not ready to give up on coal just yet, but energy firms expect the solar industry to grow 250 percent this year alone. Things are clearly looking up for India, as the increased need for renewable energy is great news not just for investors, but more importantly for locals and for the environment.